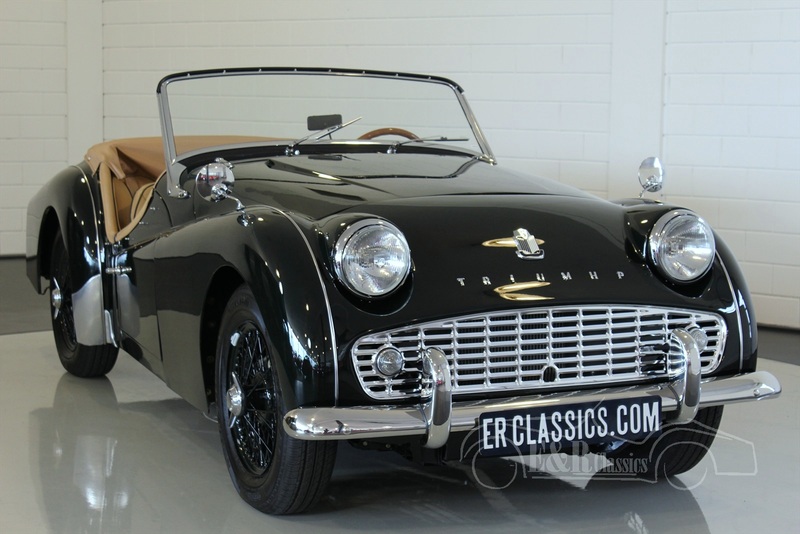 Triumph TR3 For Sale at E & R Classic Cars! The Triumph TR3 is a sports-car which was produced between 1955-1962 by Standard-Triumph in the United Kingdom. The facelifted variant, unofficially known as the "TR3A", entered production in 1957 and the final version, unofficially the "TR3B", was produced in 1962. Although the TR3 was usually supplied as an open 2-seater, an occasional rear seat and bolt-on steel hard top were available as extras. The car was powered by a 1991cc straight-4 OHV engine which initially produced 95 bhp increasing to 100 bhp at 5000 rpm. The four-speed manual transmission could be supplemented by an overdrive unit on the top 3 ratios electrically operated and controlled by a switch on the dash. In 1956 the front brakes were changed from drums to discs, the TR3 thus becoming the first series production car to be so fitted. The rear was conventional leaf springs, with solid axle and lever shocks, except that the (box) frame rails were slung under the axle. The wheels were 15inch diameter x 4.5" width, with 48 spoke wire wheels optional. Wire wheels were usually painted, either body color or argent, but matte chrome and bright chrome were also available. The front disk or drum brakes and rear drums had no power assist. Its weight was significantly more than the Morgan +4 and the "Bath Tub" (pre-911) Porsches, but not much more than the MGA and MGB. All except the Morgan, which shared the same engine, were substantially less powerful. Though, under most conditions it was very responsive and forgiving, it had a some handling vices. The chassis, which was shared by the TR2, TR3, TR3A and TR4 had limited wheel travel, and the car was somewhat tall and narrow for a true sportscar. As a result, on very hard cornering, the inside rear wheel would lift, causing sudden over-steer due to the increased load on the outside rear tire. This was particularly true with increasingly common radial tires. The original TR2/3/3A suspension was built with older, bias ply tire designs in mind. The wheel lifting was more sudden than that of other cars, because it was caused by coming to the end of the suspension travel while there was still load on the tire, so the load on the other (outside) rear wheel was a discontinuous function of cornering load, rather than just changing slope. The TR3 is a true roadster, designed for sunny weather with removable rain protection. It has a convertible top that snaps on and off and removable side curtains, allowing very low doors with padding to rest one's arm on. There are holes in the floor, with rubber plugs, so that the originally supplied jack might be used from inside the car, as did the Jaguar XK120. The optional heater was poor and the shut-off valve was under the hood. A third person could get behind the seats, if absolutely necessary. 13,377 examples of the original "pre-facelift" TR3 were produced, of which 1286 were sold within the UK; the rest were exported mainly to the USA. 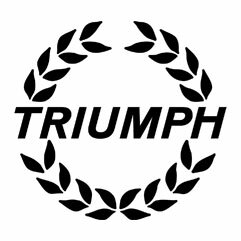 E & R Classics, your Triumph Classic Car specialist! What are the advantages of buying a Triumph TR3 car at ER Classics?